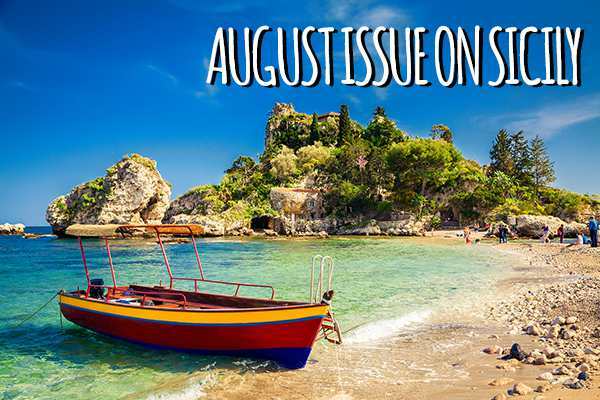 Take to the road in Sicily and experience five very different ways to stay in Sicily and add to your experience through your accommodation in everything from a converted tuna factory to a luxurious golf resort set among the vines. 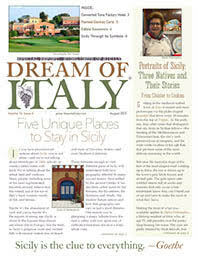 At Dream of Italy, we believe the people are the most important part of your travel experience and we profile through unique individuals who shine a light on Sicilian culture: a pastry chef who makes some of the island’s famous sweet confections, a native son who has strengthened his ties to the island and Sicily’s last donkey-cart painter. Sicily’s character can be seen in its colorful, storied symbols, each one representing history, culture and resources. We explore everything from the popular trinicaria to Sicily’s famous towers and imposing volcano. Forget the ceramics and wood carvings; the best souvenirs of Sicily are not just edible, but locally grown. Among the food products to bring home: Mount Etna Chestnut Honey, Ash-Tree Sap, Canned Tuna and of course, olive oil – but we have a very special one to recommend.